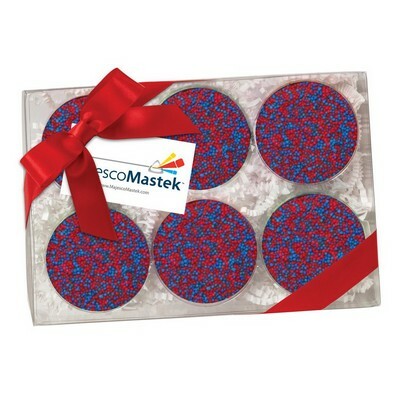 Tag imprint: 3.5" W x 2"
This Elegant Chocolate Covered Oreo Gift Box features 6 Oreos with sprinkles that can be customized to match your corporate colors. Our Oreo gift box is a crowd pleaser that will leave a lasting impression on your customers and employees. This tasty gift comes in a cute gift box with a bow. Minimum number of items in each order: 125 items.